The range of the koala is Eastern Australia from southeast Queensland to southeastern South Australia. 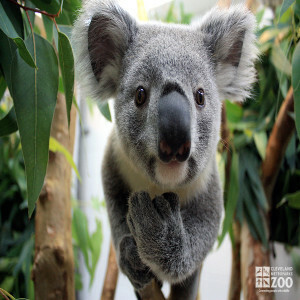 Koalas have a gestation of 30 to 35 days and joeys stay about 5 - 7 months in the pouch. The koala is mostly nocturnal and usually solitary. They are accomplished climbers and can rapidly ascend a tree in a bounding movement. On the ground they move in an unhurried quadrupedal walk, but can move quickly if the situation demands it. Koalas typically associate only for mating. 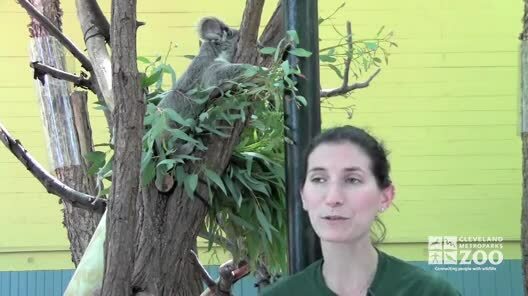 Their low quality diet of leaves provides little usable energy and the koala typically sleeps 18 hours per day. 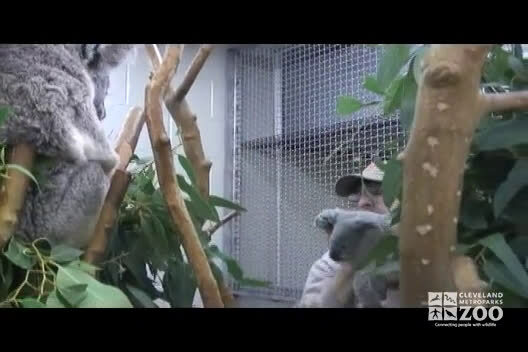 After a short gestation period the female koala licks a trail of saliva from the pouch to the cloaca. The joey emerges and follows that trail up to the pouch, where the mammary glands are. After about 5 months it climbs out of the pouch and onto the mother's back, where it stays until it is about a year old. It makes the transition from milk to solid food by eating partially digested leaves from the mothers cecum. Females bear one young every two years. Females will also adopt abandoned babies. Eucalyptus leaves and bark. Koalas seldom drink water.